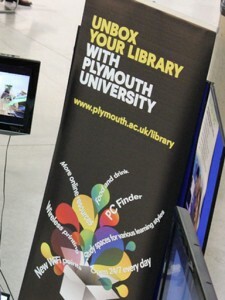 Last month I spent some time working on a creative project, with the aim of producing promotional materials to publicise the library at an upcoming Plymouth University event. Nothing particularly unusual there – this was within the realms of my fairly open role. What is interesting about it is that despite a really tight deadline and working with a group of very busy colleagues, the whole process went really well. This made me think that it would be worthwhile spending some time deconstructing what happened and seeing what lessons I can learn for the future. To kick start the ‘task’ – I won’t call it project because we didn’t really have the time to go into proper planning – we had an initial meeting that involved representatives from each library team. The meeting was useful in understanding what was required, exploring some options and deciding that we’d produce some posters and a video or automated presentation. In other words, it gave us the brief for the work we had to do. As the group was large, and some admitted not to have an interest on getting hands-on with the design, a smaller sub-group was tasked with coming up with ideas for the posters. 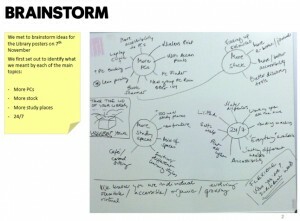 Three colleagues and I set out to brainstorm for a couple of hours. After ensuring we all were clear about the brief, we started exploring the topic we wanted to promote. I made a deliberate decision to take on the role of facilitator, even if it was at the expense of offering fewer ideas. My colleagues are closer to the service provision than I am and I felt they would have plenty to contribute. While they talked, I jotted down their thoughts and, depending on the situation, I asked questions to clarify, expand or focus their ideas. I also kept an eye on the clock so we had sufficient time to reorganise our thoughts and come up with a few concepts that would represent the message we wanted to communicate. I did have to work hard at staying in the ‘facilitator zone’ and every now and then I chipped in with my two-pennies-worth, but overall, it worked really well. Best of all, we came up with a concept that everybody liked and was a true collaborative proposition, the result of bouncing ideas off each other and then capturing the essence of what was being said. I think this was achieved by having someone who was keeping an eye in the whole picture – in this case that was me, though it could have been anybody else. I’m not saying that it couldn’t be done without a facilitator, but I think it would have been more difficult. Now that we had our mind-maps and sketches, we set out to translate them onto paper. Due to the tight deadline, I worked on the poster drafts alone, but having the material from the workshop made my life so much easier. With the presentation we used a collaborative approach again, although this time in a sequential way: I set the original template and my colleagues enhanced it by adding more content. We sought feedback from the ‘briefing team’ after the brainstorm and before the posters were sent to print. There wasn’t time to hang about so we had to set really harsh turnaround times for comments. Despite their other commitments, most people replied straight away or shortly after receiving the feedback request. And the responses seemed to be very focussed, possibly because people understood we didn’t have time for many changes and they concentrated on what really mattered to them. There were some differences of opinion, but the ‘design team’ decided to only make changes to the proposal if the majority was in agreement. This allowed us to move really fast from that point on and get all the materials ready on time. Although we received good feedback from various sources, interestingly, at the end of the process we felt that even if the materials hadn’t been that successful, it wouldn’t matter so much. They were only ideas; we could use them today and ditch them tomorrow. You need a brief and everyone to be clear about what it is. Very often people come to projects with different ideas or expectations. The library managers getting together and deciding what they wanted was a crucial part in the success of this task. Although I said earlier no planning was done, by that I meant ‘planning’ in project management terms. Clearly you do need to sort out a timeline and make sure everyone is clear about their role and deadlines. Deadlines focus the mind and help you and others concentrate on what is important. Work in beta – there are some lessons to be learnt from agile development. We increasingly work with fewer resources and more demands. We need to readjust our expectations and be able to deliver outputs that are not perfect, but they are good enough. I’ve been involved in this kind of work in the past, where drafts have been around for months. In this case, because there wasn’t time to mess around, we made ‘executive decisions’ and it worked. I wouldn’t recommend this approach for everything, but at the end of the day, a poster is just a poster. If people don’t like it, we can bin it and start again. Obviously we don’t always have the opportunity to try things out and see what happens, but I really think we could be more agile in the way we produce content and resources. Something else that would have helped us to speed things up – and saved a lot of angst when trying to evaluate and act on the feedback received from colleagues – would have been to ask the ‘briefing team’ who had ultimate editorial control. It is quite frequent for projects and tasks in our department to have many stakeholders and/or sponsors. This slows down decision making and reduces the chances of a quick turnaround. Having a single person who is responsible for saying yes or no to a design, even if they take advice from others, could be a huge improvement. I feel that it would also be useful to turn experiences like this into some guidance that people could follow when faced with a similar task. I’m certainly hoping that by sharing my thoughts with others, we can perhaps improve the way we handle creative work as a team. Print article This entry was posted by Elena on 03/12/2011 at 10:45 AM, and is filed under Design. Follow any responses to this post through RSS 2.0. You can leave a response or trackback from your own site.